And as of today, we're halfway through 2018! These first six months have had their challenges, but for the most part it's been a positive year and I'm really looking forward to the rest of it. Especially since we'll finally be doing more of the "getting out of town" bit...we've been squirreling away our vacation days and we've got some trips coming up that'll hopefully be fun! This month, though, was mostly pretty calm. The Sky Is Yours: First of all, this book is intensely weird. Dragons are only the beginning of it in this story of a far-future New York City menaced by the scaly beasts that's been winnowed down to the very rich and the very poor holding out. Weird is usually alienating to me, and indeed I never quite bought all the way into it, but damn if it wasn't well-written, entertaining, and compulsively readable. A very promising debut. Boy, Snow, Bird: A fresh and powerful take on the classic Snow White fairy tale, Oyeyemi plays with race, surface appearances, identity, and mirrors. Up until the end, I found it compelling and thought-provoking, but there's a twist that felt...off, and kind of derailed the whole thing. Motherless Brooklyn: I was intrigued when this was selected for book club, since I'd had it on my TBR a while ago and then actually taken it off later because I decided I probably wouldn't like it. Was I right to add it or delete it then? The latter. I hated it. I never got involved in the mystery or cared about anyone involved. The Girl With All The Gifts: I bought this on a Kindle sale whim and was unsure about it before I started reading it...horror can be very hit or miss for me. But it's really good, twisting the zombie story to give us a tale about an unexpected bond and what it really means to be human after all. Love Medicine: This book is more like intertwined short stories than a novel, but it's beautifully written and an interesting look at the lives of modern Native Americans and explores the rich variety of complications that love and family bring. I'm definitely interested in continuing the series! Sloppy Firsts: I don't know how I missed this series when I was a teenager myself, because I would eaten it up. As it is, even 32 year-old me really enjoyed this story of a misanthropic high school girl trying to make it through the endless sea of high school b.s., which took me back in the best possible way. This is another series I'll be continuing. The Completionist: Feminist dystopian fiction is having a bit of a moment, but to be honest this was not a shining example of the genre. It's set in a future where there's been disaster resulting in a virtual vanishing of water and a growing crisis of fertility, leading to increasing restrictions on women who've managed to get pregnant. A young ex-Marine and his older, pregnant sister search for their other sister, a Completionist (basically a midwife) who's gone missing. I loved the character of the pregnant sister, but the book as a whole fell apart under scrutiny. The Feast of Love: This Ann Arbor-set book had seeds of greatness (the prose is amazing, and the characters are vivid) but I couldn't get over how falsely the portions of the book written from the perspective of a young woman rang. It completely undermined the book for me. Primary elections: Our client that had a primary made it through, so now we've got that race and a couple other to get ready for in November! Campaigns are hard work but they're always interesting and I'm fortunate in that I've gotten to work with amazing candidates that I really believe in. Anyone who doesn't think their votes count should be there as local candidates watch numbers come in, every one matters! Our second wedding anniversary: Two years of married life down, forever to go! We celebrated with an ice cream cake (an annual tradition now!) on Father's Day, and then our favorite Italian place for the day-of, and I am a very lucky lady. That some people have made blogging a lucrative full-time career should no longer be a surprise. We've all heard about the thousands of dollars a Kardashian can command for a single Instagram post, and the reality is that there are people whose reach and dedicated following in their fields (travel, fashion, parenting, etc) are valuable enough to be worth a substantial amount to marketers. But by and large, this doesn't extend to book bloggers. Laura at What's Hot? has a very interesting piece about why the bookternet should be getting paid. My own following and engagement is small enough that I'd never be able to turn pro at this, but for those who do have it and whose work leads to sales for publishers, they should be compensated! "She had not thought about it at the time, as she had not believed that anything could happen to Ben. Now she thought about it. There comes a time in the life of every human when he or she must decide to risk 'his life, his fortune, and his sacred honor' on an outcome dubious. Jill Boardman encountered her challenge and accepted it at 3:47 that afternoon." Growing up, it's easy to believe that almost everyone lives more or less the way you do. It's only as you get older that you start to realize that's not true. But it's hard to resist the urge to think of the way you grew up as the right way. But what if it wasn't just the people in your neighborhood or town that you were comparing yourself to? What if it wasn't even the same state or country? What if it was a person who came from an entirely different world? 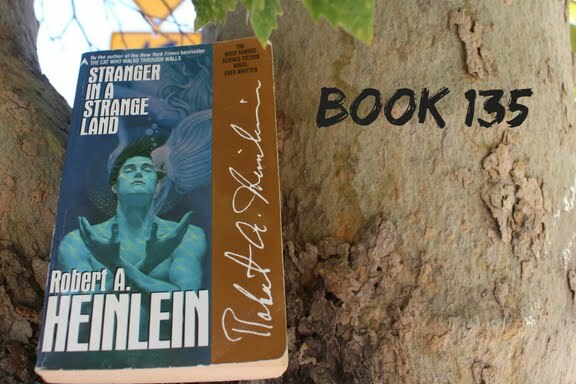 Valentine Michael Smith, the central character of Robert Heinlein's Stranger In A Strange Land, is an entirely unique person: the son of two space explorers on Mars who died shortly after his birth, he was raised by Martians in Martian culture. As an adult, Mike returns to Earth to explore his "home" planet. Initially hidden away in a hospital by the government, which is trying to figure out what to do with him, he's discovered by a reporter and smuggled out by a nurse. That nurse, Jill, becomes his constant companion, sheltering and protecting him as he learns about the world and becoming something of a disciple as he comes into his own and begins teaching Martian ways to his friends and, eventually, the world. Jill and Mike are taken in, after their initial flight from authorities, by author/lawyer/doctor Jubal Harshaw, an older, cynical man who lives in a sprawling compound with three young women he employs as on-call stenographers for his writing and a handyman to keep things in good repair. This group forms the core of what becomes the Church of All Worlds, a religious movement centered on Mike and the teachings he espouses, including the deep significance ascribed to the sharing of water, the concept of "grokking", and (of course! ), non-monogamous sexual relationships. The rise of this church upsets the established power structure of this future Earth, with predictable results for the figure at the center of this upset. Smith is both human and profoundly non-human, which raises interesting questions about what exactly it means to be a person, a fairly common theme in the science fiction genre. Perhaps because it had been done before, or perhaps because he was disinclined to explore the issue, this is not the route that Heinlein chooses to go. Rather, he uses the story to explore the "Martian" philosophy on life. Which is interesting, for a while. But since the portions of the book that are effectively espousals of this philosophy actually make up a solid majority of the book, with relatively little character development, I found myself getting bored pretty quickly. The plot is pretty straightforward: it's a messiah tale, with the kind of story progression you'd expect for this kind of tale. The prose is...not fluid. It's clunky, and the long passages of expository dialogue aren't handled with any particular deftness. While it raised some thought-provoking ideas, it never captured me as a piece of literature. I don't think there's any reason genre fiction can't be successful from a literary standpoint, but I never got wrapped up in the story this book was trying to tell me. It may be a sci-fi classic, but it didn't do it for me. I wouldn't recommend it. 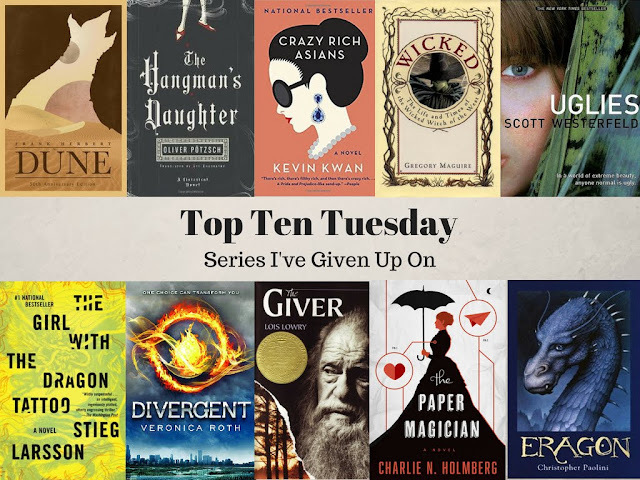 Tell me, blog friends...what are your favorite genre fiction books? Top Ten Tuesday is a weekly linkup of book bloggers hosted by That Artsy Reader Girl! This week, we're looking to series we've tasted and decided not to go back for a second helping of. 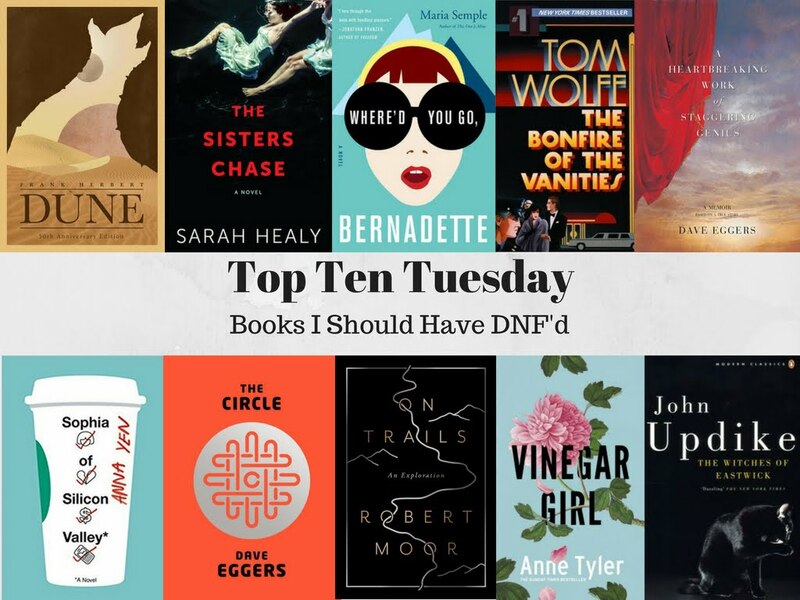 I don't do a ton of series reading, to be honest, but here are ten books that didn't do it well enough for me to pick up sequels. Crazy Rich Asians: This series is usually pitched as a frothy delight, and for me, it was a little too frothy. I didn't care enough about any of the characters to feel compelled to continue to follow them. The Hangman's Daughter: I'm convinced it must have been poor translation that made this book such a dud, because it's got a bunch of sequels and there was nothing I read that made me feel like even one was necessary. The Paper Magician: This book was fine and made good airplane reading (engaging enough to keep you reading along, but not threatening to make you actually think) but it didn't have the spark that made me want to re-immerse myself in its world. The Girl With The Dragon Tattoo: I read and loved the original trilogy, but I'm generally not into the idea of a new writer picking up where another left off...and nothing I've read about the quality of the continuation makes me feel any particular regret about this. Divergent: I thought the first one was alright, but the second one was definitely not good. The final entry was widely panned, so I will be a-okay if I never read it. The Giver: One of my favorite books as a teenager, I think it told such a good story that the idea of continuing on doesn't feel remotely necessary. Eragon: I read and really liked the first one when it came out, and then when the second one came out I read like 100 pages and never picked it back up again and can't muster up an interest in getting back into it. Dune: I know there are people who just can't get enough of this world since there are approximately a billion sequels, but the first one was more than enough for me. Wicked: I've re-read this book probably a dozen times, I like it that much, and I've liked other work by Maguire, but the idea of reading the sequels has like zero appeal. Uglies: I read the first and second one and enjoyed them both and then just lost interest entirely. "Ninety percent of all experiments fail. This is fact. Every scientist has proven it. But you eventually start to wonder if this high rate of failure is also you. It can't be the chemicals' fault, you think. They have no souls." When I was in middle school, I decided I wanted to be a lawyer. I had always been the kind of kid for whom "bad behavior" most directly translated into "mouthing off", and I loved to play devil's advocate, and I was stubborn like an ox. I was captain of the mock trial team in high school, and I really thought being a lawyer was exactly what I wanted. Until I got to law school, which I hated. And then started practicing, which I hated even more. Figuring out that I needed to go another way is a decision I'm constantly thankful I made. Coming from an adult perspective, I think it's silly that we expect 16 year olds to have any idea what they might want to do for the rest of their lives. I think of myself as being pretty smart, but it turned out what I was sure I wanted to do at 16 was incredibly wrong for me. And the protagonist (never named) of Weike Wang's Chemistry is in kind of a similar boat. 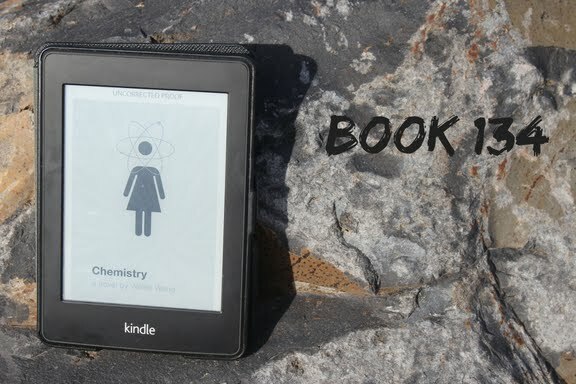 Pursuing a Ph.D. in, of course, chemistry at a prestigious New England university, she has a bit of a meltdown as her experiment fails to produce results. Although she does love the field, she begins to question her choices about everything in life as she takes time off of her program. There's not a lot of "plot" in this book, really. The protagonist is trying to decide what to do about her long-term relationship with a fellow chemist who has proposed to her but she's not sure she wants to marry, trying to figure out how to support herself without her graduate student stipend, being there for her best friend through pregnancy and early motherhood and marriage crises, and figuring out when and how and if to tell her Chinese immigrant parents that she's not in school anymore. It is this last matter that most preoccupies her, and much of the book is made up of her recollections of her childhood, of her parents' relationships with each other and with her, of the pressure she feels to succeed in the ways that they value in order to validate their sacrifices. Stories like these illustrate the power of "own voices": an Asian-American woman telling the story of an Asian-American woman. A lot of non-Asians look to them as a so-called "model minority", hard workers somehow naturally gifted at math and science. Of course the reality behind that is more complicated (it's as much a result of the kinds of immigrants that tend to leave Asia behind to travel to America as much as anything else), and Wang pulls back the curtain on what might seem like a neat little family of a scientist, a housewife, and their scientist daughter to show the internal workings that are just as messy as anyone's home life. That being said, evaluating Chemistry on its novelistic merits reveals a book that is good but not great, and quite obviously a debut, though a promising one. Our nameless narrator is at times rather formless, and mostly reacts to the events around her rather than being proactive. She's very unsure of herself after breaking out a track that she found herself in more than chose, and while that's understandable, it makes her hard to really get enough of a feel for to connect with much. But Wang's writing is sure and emotionally true, and I enjoyed this book and would recommend it, especially to 20somethings that are wondering if they're on the right track. Tell me, blog friends...did you end up doing what you thought you would at 16? Top Ten Tuesday is a weekly linkup of book bloggers hosted by That Artsy Reader Girl! I've always maintained that I'm awful at compiling lists of beach reads, so I'm taking this week's topic about summer books to literally share with you the books I'm planning on reading over the next few months! The Completionist: It seems like dystopian stories with a feminist bent are pretty popular these days, but something about this one caught my eye and I've got a review copy to read! The Feast of Love: I'm a sucker for stories set in places familiar to me, and Baxter's supposed a great writer, so this Ann Arbor-based book about the love people share in various types of relationships seems like a good place to start with him. Perfect Murder, Perfect Town: Jon Benet Ramsey's murder seems unlikely to ever be solved, but I'm definitely interested in reading the foremost true crime account of what happened. The Looming Tower: I'm a little worried this is going to be substantially similar to Ghost Wars, which I read in January, but I'm curious to read it anyways. My Own Words: Ruth Bader Ginsburg is a role model and a national treasure and my husband bought me this book quite a while ago so it's time to actually read it. 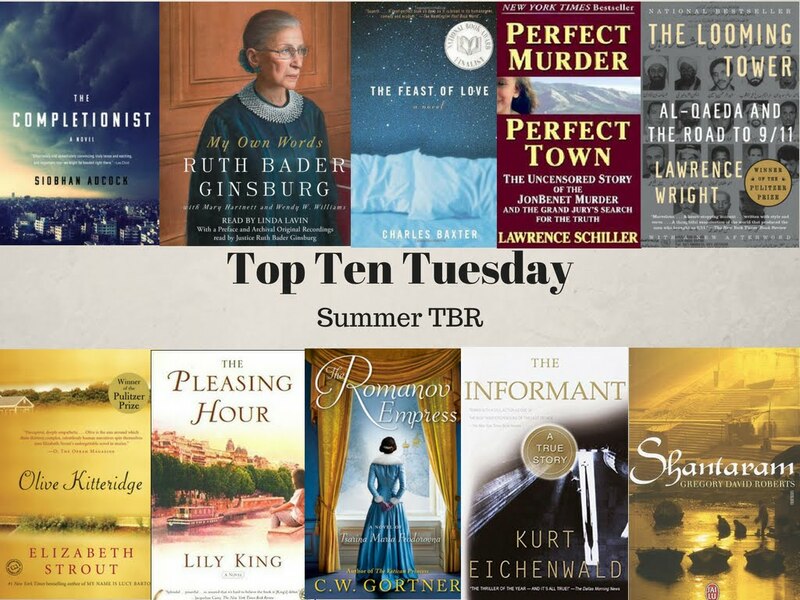 Olive Kitteridge: I'm always here for prize winners, and this one got the Pulitzer in 2009. I've also never read Strout before, so here's hoping I enjoy her work as much as others have! The Romanov Empress: Ah, self-indulgence in the form of historical fiction about royalty. This book follows the mother of Nicholas II, which will be a new perspective for me to read from! The Pleasing Hour: I've actually read some mixed reviews of this debut, but it's short and it was cheap for the Kindle when I bought it so I'll try it out. Shantaram: I do love a gigantic sprawling novel. The Informant: Another huge book, this one is about a federal investigation of price-fixing by a major worldwide corporation and the sometimes dicey control the FBI had over its prize witness and sounds fascinating. "She is such a trainwreck. But that's why we like to watch. The spectacle of the unstable girl-woman. Look at her losing it in public." I'm a mostly pretty together person these days. I'm married to the person with whom I've been in a long-term relationship for years now, we have a dog, we have steady white-collar jobs. We enjoy our wine and beer, but I can count the number of hangovers I've had in the past year on one hand. 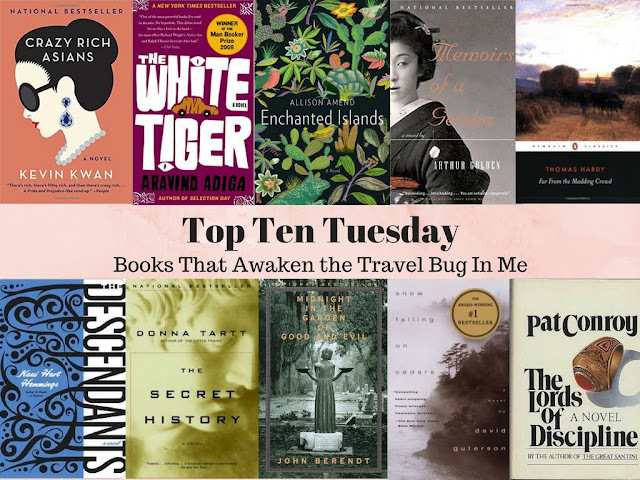 I write a book blog, that's how cozily normal I am. It wasn't always so. My 32 year-old self is a much, much different person than my 22 year-old self. At 22, I was a mess. I partied often, drank more than anyone would consider reasonable, and I made some questionable decisions about who I chose to invest my energy in. I never got into any sort of actual trouble, but things were a little sloppy there for a while. I think a lot of young women go through unanchored periods like this (and young men, for that matter). Stumbling around trying to figure out who and what we are, what we want, where we belong. Kate Zambreno's Green Girl focuses on this exact time of life. Ruth, an American in her early 20s, is living in London and working at Harrod's, which she's nicknamed Horrid's, selling perfume. Ruth's insecurities about herself and her place in the world are reflected even in what kind of wares she hocks. She's not assigned to the fancy prestige brands, but rather the celebrity scent of a teenage American pop star. Ruth is recovering from the dual shocks of losing her mother and the end of an intense, damaging relationship, and is desperately lonely. She's "friends" of sorts with a young Australian woman who lives down the hall in the rooming house she lives in. There's little real connection between them, but at least it's another person to spend time with. Ruth makes some hesitant stabs at new relationships, but between the two men who both treat her as an object in their own way (one by putting her on a worshipful pedestal, and the other as a muse for his own artistic ambition), she can't actually bond with anyone. She knows she's stuck, but has no idea how to free herself. 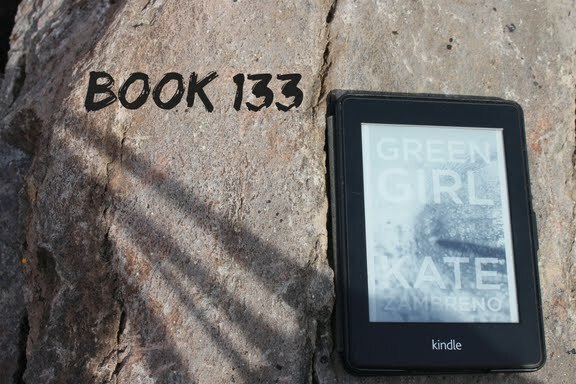 Green Girl is relatively simple in terms of plot, but I found it challenging in its own way. It's not structured like a typical novel: each section (there are many, I don't believe any are longer than 10 or so pages) is prefaced by a quotation from another author writing about young womanhood. Zambreno's own writing is almost like prose poetry, short interlinked paragraphs that are about as much about the feeling they capture as moving the story forward. It's not even as much a portrait of Ruth as a character as it is a portrait of what it is to be struggling into womanhood in one's early 20s, feeling the openness of one's potential future to be as much threat as promise. I was initially put off by it and was glad that at least it was short so I wouldn't be spending undue amounts of time on something I found alienating, but eventually I got used to its rhythm and once I got there it was hard to put down. Although she's not a strongly drawn character, Ruth's aching sadness comes across so vividly that watching her stumble and make mistakes is heart-wrenching. It's an odd little book, and its flaws (the lack of character development and story structure) are real, but it has power. I'd recommend it if you're down for something a little less conventional or had a messy time of it in your 20s. Tell me, blog friends...do you prefer novels that play with form or are you a traditionalist? "That is the way we decided to talk, free and easy, two young men discussing a boxing match. That was the only way to talk. You couldn't let too much truth seep into your conversation, you couldn't admit with your mouth what your eyes had seen. If you opened the door even a centimeter, you would smell the rot outside and hear the screams. You did not open the door. You kept your mind on the tasks of the day, the hunt for food and water and something to burn, and you saved the rest for the end of the war." Friendships that form under intense circumstances can be especially enduring. Most of us are or at least know someone that's still friends with someone they met at college orientation, just because you find yourselves thrown together at a vulnerable time. It quite often has little to do with what you actually have in common, but something about sharing new and interesting experiences with a person bonds you in a way that's hard to compare. I think of some of my law school classmates almost as war buddies. 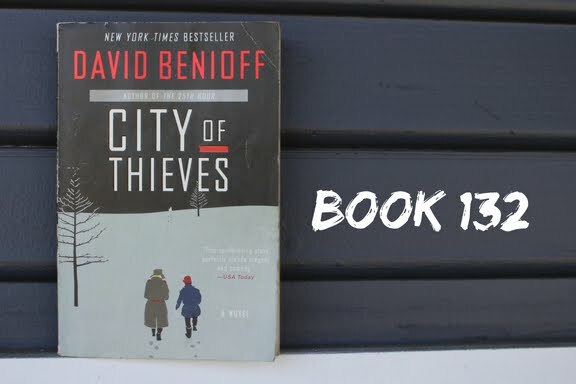 In David Benioff's City of Thieves, Lev Beniov is an introverted Jewish teenager living through the siege of Leningrad during WWII. One night, watching for air strikes on the roof of his apartment building with his friends, they spot a paratrooper and race through the streets (well after curfew, of course) and run after him. The man is dead, and the teenagers steal whatever they can off his body, with Lev in particular snagging a knife. The police spot them and the kids run...but Lev is caught. Thrown in the notorious local jail, he thinks he's dead. Then his cell opens in the night to admit Kolya, a bold 20something in a military uniform who claims that he was snagged after going AWOL to defend his thesis. Instead of being executed in the morning as Lev fears, he and Kolya are given a task: to collect two dozen eggs in a starving city for a wedding cake. What emerges from there is a fairly predictable quest narrative. Lev and Kolya journey within the city and eventually outside of it to find the eggs they need to get their ration cards (i.e. their only link to the extremely limited supply of food) back, and as they encounter characters and obstacles and characters who are obstacles, they grow closer. We know that Lev survives into the present day because of the framing device Benioff uses, in which he presents Lev as his own grandfather relating the story to him, but exactly how he does, and what will become of the people around him are unknowns that propel the plot forward. Both Kolya and Lev are well-written characters, and although the structure of their journey is a familiar one, Benioff's prose is lively and entertaining and a pleasure to read. I was happily surprised by how much I enjoyed this book. I picked it up because Benioff is a producer of Game of Thrones, one of my favorite TV shows, and I'd heard it was pretty decent, but I usually have a hard time connecting with stories that feel decidedly "masculine". But this was a coming-of-age story that wasn't overly steeped in gendered notions of what that means. It's still more masculine than feminine, but not to the point where I felt alienated from it as I often do with stories that posit violence and/or emotional repression as what it means to become a man. It's as much as anything a story about a brief, intense friendship that forever changed a teenage boy, and who can't relate to that narrative? I definitely recommend this book, I'm already looking forward to re-reading it someday when I finally read through my TBR. Tell me, blog friends...have you still got friends that you made when you went through hard times together?